Leg pain doesn't always mean there is something wrong with the leg itself. Because of the way our nervous system functions, you may, for example, have pain in your foot when the problem actually lies in your lower back. 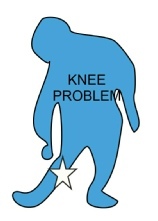 Knee pain is a common presentation and can be caused by a number of issues many of which are treatable. Your chiropractor will be able to identify whether the source of your problem is where you feel the pain, or if it is radiating from another part of your body, and then treat you accordingly.